Portland cement concrete (PCC) pavement undergoes repeated environmental load-related deflection resulting from temperature and moisture variations across pavement depth. This has been recognized as resulting in PCC pavement curling and warping since the mid-1920s. Slab curvature can be further magnified under repeated traffic loads and may ultimately lead to fatigue failures, including top-down and bottom-up transverse, longitudinal, and corner cracking. It is therefore significant to measure the “true” degree of curling and warping in PCC pavements, not only for quality control (QC) and quality assurance (QA) purposes, but also for better understanding of its relationship to long-term pavement performance. Although several approaches and devices—including linear variable differential transducers (LVDTs), digital indicators, and some profilers—have been proposed for measuring curling and warping, their application in the field is subject to cost, inconvenience, and complexity of operation. 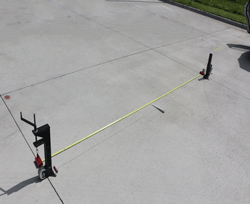 This research therefore explores developing an economical and simple device for measuring curling and warping in concrete pavements with accuracy comparable to or better than existing methodologies. Technical requirements were identified to establish assessment criteria for development, and field tests were conducted to modify the device to further enhancement. The finalized device is about 12 inches in height and 18 pounds in weight, and its manufacturing cost is just $320. Detailed development procedures and evaluation results for the new curling and warping measuring device are presented and discussed, with a focus on achieving reliable curling and warping measurements in a cost-effective manner.